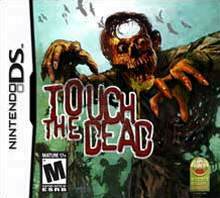 Touch The Dead is a House Of The Dead style shooter game for the Nintendo DS. I’ve only spent a small amount of time with it, however, if you’re a fan of the zombie shooter games, you’ll definately enjoy it. It’s not the pinnacle of horror-gaming, but, it did make me jump once or twice. The game is fairly difficult. Perhaps it’s just that kitten paws aren’t the most dexterous with a stylus. So you may have better luck than I did. I was only able to get to the middle of the 2nd stage. The zombies are extremely tough even when shooting them in the head it seems often you’re unable to kill them before they arrive and start eating at you. It’s still quite fun even if it does seem futile at times. The gameplay’s fairly straight forward, shoot zombies, reload, shoot more zombies, choose a path, and repeat. The graphics are pretty good for a DS game and the sounds aren’t without their merits. This kitty just didn’t think they were anything exceptional. I’ll definately be revisiting the game because I cut my time with the game a bit short. I’d decided after spending a few hours of waging war against the zombies on the second stage that I’d get more out of my time getting some more reviews of other games before I return to Touch The Dead to hone my skills. If the game was called “Touch The Mouse” I’m sure I’d be much better at it.